In this post we examine five of the best-selling nail polish dryers. These drying lamps help expedite the finger and toe-nail drying process. If there is anything that makes a manicure tedious, its having to sit around and wait for your nails to dry. This can be especially frustrating if you enjoy doing your own nails. However, you don’t have to wait forever for your nails to dry anymore. With how easily available nail dryers are today, you don’t have to think of them as just a perk of getting your nails done in a salon. Instead, you can enjoy the convenience of this invention right in the comfort of your own home! The way that a fan nail dryer works is rather straightforward; it blows air onto the wet polish to speed up the drying process. However, a professional UV nail dryer is another idea all together (Source). After all, how can light speed up how fast your nails dry? First of all, UV gel nails have a different composition than regular nail polish. This means that rather than just the “light drying your nails” what you are experiencing is a reaction between the UV rays and the special polish (Source). An interesting concern that several customers voiced was the use of UV rays on your hands. While there are many arguments as to the use of UV rays and rather it is concerning or not, none have really been solidly proven. However, it is a common belief among scientists that these professional UV nail dryers take so little time that they are much less dangerous than other commonplace products such as tanning beds (Source). First, consider whether you want an LED or UV light nail dryer. LED lights – such as the MelodySusie Portable LED Nail Lamp and the Kedsum12W LED Lamp – only dry LED specific polish brands. UV lights or UV/LED lights, on the other hand, will cure all types of nail polish. 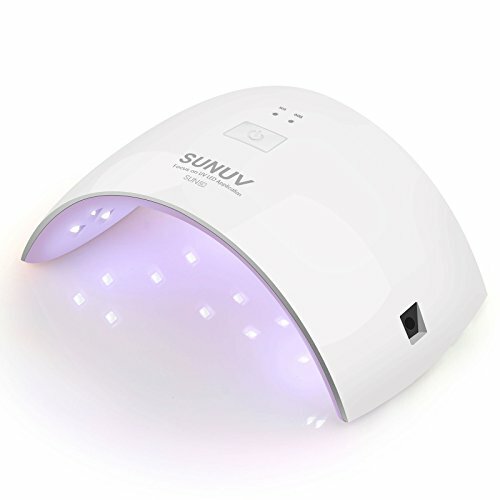 These models include the Sunuv Nail Dryer, USpicy 36 W Lamp, and Uspicy 48W LED Nail Lamp. However, the LED models are also quicker than their UV counterparts even though these LED options are usually a bit more expensive. Each of the options that we are looking at today is long-lasting but the LED bulbs will outlast the UV options. If you’re looking for a top-rated nail dryer, you might want to consider the Sunuv 24W LED UV Nail Dryer. Users like the usefulness of this nail dryer, but some do complain about poor performance. This all-in-one nail dryer features UV+LED dual light source and is thus applicable to curing almost all nail gels, including LED gels, UV gels, Hard Gels, builder, sculpture gel, gem glue etc. Its light is close to white light and has no harm to eyes and skin. This item seems like a good choice if you want a durable nail dryer suitable for both home and salon use. In general, users are happy with the Sunuv Nail Dryer Curing Lamp and find that it cuts cutting time significantly. They state that it fits the entire hand. Users appreciate the motion sensor feature which enables turning the unit on automatically when inserting hand and turning it off on removal. However, some buyers complain that the device doesn’t work properly – it takes too long to cure each coat (base, color, top). Another complaint regards the inconsistent timer. The MelodySusie Portable LED Nail Lamp might be a solid choice if you’re looking for a mini-sized, compact portable nail lamp, perfect for home use and travel. Users like the handiness of this nail drying lamp, but some do complain about low wattage. This product cures LED gel polish in just seconds and makes it last up to 2 weeks. 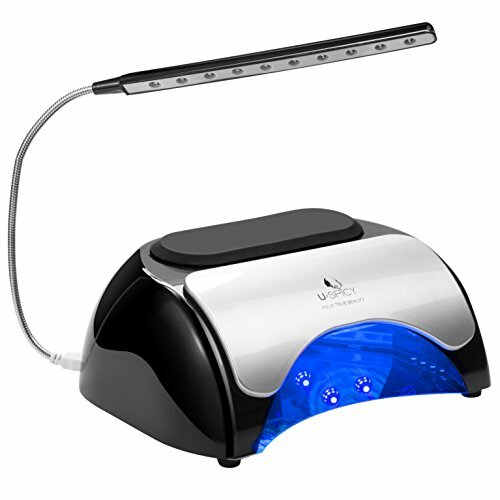 The nail lamp is equipped with 3x2W LED light beads and it’s small, lightweight, yet powerful. Aside from the nail dryer, you get a 100V-240V A/C adapter, full usage instructions, and a welcome card. This item could be a solid addition to your beauty arsenal, whether you’re a seasoned pro or just learning to do your nails for the first time. In general, users have a favorable opinion of the MelodySusie 6W Mini Nail Drying Lamp.They agree that it is small but powerful. Users like that it is easy to use, portable and practical.All in all, most of the purchasers state that you get salon quality nails with this device. However, some buyers complain about the low wattage due to which it takes too much time for a gel to cure. Several purchasers complain about the size of the lamp which doesn’t fit the thumb. This is a quick way to dry your nails. Even professionals use it as a quick and reliable source for drying nails. You can avoid the chance of smearing or smudging by just slipping your hand into a nail dryer for a few moments. If you are prone to using multiple layers of nail polish – as many of us are – a nail dryer can speed up the process by a great deal of time. 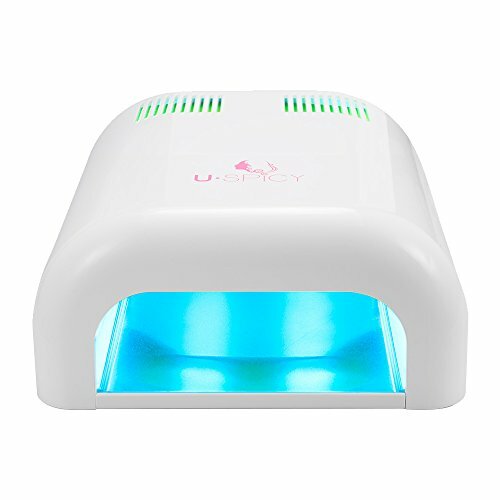 The USpicy 36W Nail Dryer UV Lamp is a solid option if you want to do your manicures in the comfort of your home.Users like the power of this device, but some do complain of the unit breakage soon after the purchase. 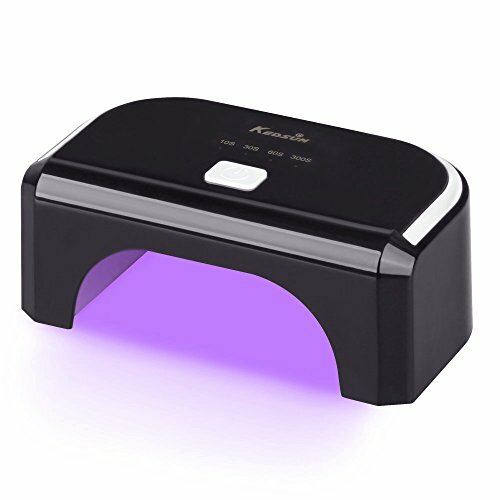 This product allows for a fast, safe and odorless multi-purpose curing of a UV top coat, UV builder gel and a variety of other nail polishes.Thanks to 4 super powerful PL UV-A bulbs this nail dryer will promise you a safe, smooth and precise manicure or pedicure in no time and without any lingering smells. It features a smart adjustable timer that lets you choose between the two different timer settings of 120s and 180s, depending on the number of coats and type of nail polish you are curing. This portable manicure dryer might be a solid choice if you want to cure a heavy coat on a fancy manicure or a final touch to a delicate pedicure. In general, users have a favorable opinion of the USpicy MACARON Nail Dryer and they agree that it has great power, thanks to which the nail polish cures quickly. They conclude that the device is perfect for home use. However, many purchasers report that the unit stopped working after several uses. If you’re looking for a nail dryer,you might want to consider this one offered by USpicy. Users like the value/price ratio, but some do complain of receiving a defective item. This product is a portable nail dryer that speedily and safely cures all kinds of LED and UV gel polishes wherever you are.It features a comfortable hand pillow which provides a place for hands to rest when applying gels. The underside of the dryer is coated with a non-slip covering to prevent it from sliding or getting knocked over. This nail drying lamp might be a good choice if you want one with an eye-friendly safeguard covering. In general, users have a positive opinion of the USpicy MACARON Nail Drying UV Lamp and they agree that it is a great value for the money. They appreciate the automatic turn on/off feature, as well as the fact that it fits the entire hand. However, some buyers complain that the item arrived broken or missing parts. Several purchasers state that their unit broke after only several uses. The KEDSUM 12W LED Lamp One-button Control is a good option for getting your nails done beautifully on your own time at home without spending a lot of money at a salon.Users like the effectiveness of this nail drying lamp, but some complain about receiving a faulty item. This product is a travel nail lamp which works for almost all kinds of LED gel nail polishes. It quickly and safely dries LED-cured gel nail polish. You can choose between 10 seconds, 30 seconds, 60 seconds and 300 seconds drying settings. The unit is available in white and black color. If you want a mini-sized, portable nail drying lamp, this one might be a good option. In general, users have a favorable opinion of the KEDSUM Nail Drying UV Lamp and they agree that it cures a nail polish quickly. They state that it is a great product for the price. However, some buyers complain of receiving a defective item. Several purchasers state that it doesn’t fit the entire hand (the thumb can’t fit). 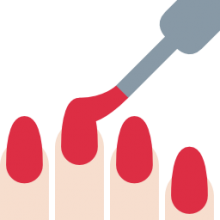 We thought it was only fitting, since we've examined some of the best nail dryers on the Internet, to explore how beauty and fashion websites recommend that you make your nail polish dry faster. The common pain point is that after applying a beautiful coat of fingernail paint that you have to sit around for a while to wait for it to dry. This is especially tedious if you need to respond to emails or texts or have a craving to refresh your Instagram feed. Instyle.com has a couple recommendations. They say that after your manicure you can get a hair blow out as you wait for your nails to dry. They also say that you can dip your fingernails into some cold water, waiting for a minute, which should help the polish to set. Another option is you can upgrade the lacquers that you use- more expensive options can provide quicker drying top coats. Heading over to wikihow.com they recommend you try out using thinner coats of polish. This works because frequently nail polish is applied in multiple layers and is too thick to properly dry. You can also try using a hair blow dryer- make sure to employ it at the coolest setting because hot or warm air will actually soften the nail polish and prevent it from drying. Another innovative option, you can use an air duster squeeze bulb to blow on your nails. Another fun DIY nail drying hack is using the cooking spray from your kitchen to help quickly dry your nail polish. You just need to spray it on, let it sit for a minute, and then wash the oil off. As we've seen, there are a lot of different strategies for speeding up the cuticle drying process besides purchasing one of these potentially expensive and inconvenient to use nail dryers. Prevention.com writes about the dilemma saying that a small ice bath is one of their favorite ways to set the polish, helping it to solidify and guarding against the divots. Indeed, it might be that patience is the best weapon. You might want to take a couple deep breaths before diving into your purse and potentially ruining your new fingernail paint job.